To Cite: Havaei S A, Halaji M, Vidovic S, R. Dillon J, Karbalaei M, et al. Prevalence and Genotyping of Methicillin-Resistant and - Susceptible Staphylococcus aureus Strains Isolated from Patients in a University Hospital, Isfahan, Iran, Jundishapur J Microbiol. 2017 ; 10(5):e13571. doi: 10.5812/jjm.13571. Background: Staphylococcus aureus is one of the major causes of community- and hospital-acquired infections, with methicillin-resistant strains showing the highest rates of morbidity and mortality. In our previous experiment, isolates, which were also used in the present study, were assessed using multilocus sequence typing (MLST). The sequence types (STs) were determined and documented in the corresponding database. Objectives: In the current study, the isolates were subjected to genotyping with coagulase, SCCmec, and agr typing methods. Methods: A total of 54 isolates were evaluated by polymerase chain reaction (PCR) assay for mecA gene, Sccmec typing, and finally PCR-restriction fragment length polymorphism (RFLP) for coagulase (coa) gene using Alul enzyme. MLST of the isolates showed that the majority of methicillin-resistant S. aureus (MRSA) isolates belonged to ST239. Results: Phenotypic and genotypic tests revealed that 21% of the isolates were MRSA. PCR-RFLP test for coa gene showed similar patterns of MRSA isolates. The majority of the isolates were community-acquired and belonged to the Sccmec type IV, whereas the remaining were hospital-acquired and classified as type I (22.2%) and type III (2.2%). Conclusions: Most of the isolates belonged to agr type I, followed by type II and type III. Agar dilution method showed higher sensitivity and specificity, compared to the disk diffusion method. The majority of the isolates were community-acquired and belonged to Sccmec type IV and agr type I, whereas the remaining were hospital-acquired and classified as types I (22.2%), type III (2.2%), and agr type I.
Staphylococcus aureus is a Gram-positive coccus, commonly found on the skin and mucosal membranes. It is the major cause of hospital-acquired infections, and methicillin-resistant S. aureus (MRSA) isolates are considered a serious health concern (1-3). Currently, S. aureus strains are spread worldwide with a frequency of over 70% in Asian countries (eg, China, Korea, and Taiwan), over 50% in North America, 20% in Europe, and nearly 50% in Iran (4-9). The resistance of MRSA strains to methicillin is mediated by a protein, known as penicillin-binding protein 2a (PBP2a), which exhibits poor affinity for beta-lactams. PBP2a is encoded by mecA gene, located on the chromosome through a large gene cassette, known as staphylococcal cassette chromosome mec (Sccmec) (10). Patients with MRSA infections are admitted to hospital for a longer duration, compared to those with methicillin-susceptible S. aureus (MSSA) infections (11). Compared to MSSA, MRSA infections elicit more adverse effects (including renal failure) and lead to significantly higher rates of morbidity and mortality (12). Therefore, early diagnosis and isolation of these patients can prevent the spread of MRSA strains in the hospital and among the medical staff. Moreover, through various valid and accurate typing methods, it is possible to determine the source and route of infection and subsequently adopt measures for the prevention and treatment of these infections (11, 13). With this background in mind, the present study was performed in continuation of our previous experiment on MRSA and MSSA strains, isolated from Alzahra hospital of Isfahan, Iran, where we determined the sequence types (STs) of these isolates, using multilocus sequence typing (MLST) (1). The aim of this study was to investigate various tests, including agar screening, minimum inhibitory concentration (MIC) calculation using agar dilution, polymerase chain reaction (PCR) for mecA gene, Sccmec typing for mecA-positive isolates, and typing of S. aureus based on PCR-restriction fragment length polymorphism (RFLP) for coagulase (coa) gene. A total of 54 S. aureus strains were collected from samples in Alzahra hospital of Isfahan, Iran. S. aureus isolates were identified by conventional biochemical tests, including Gram staining, catalase test, mannitol fermentation, slide and tube coagulase test, and DNAase test. Screening for methicillin resistance was performed, using agar screening test. For this purpose, 6 µg/mL of oxacillin powder, along with NaCl 4%, was added to Mueller-Hinton agar (HiMedia, India) (14, 15). S. aureus ATCC25923 was used as the control. For this purpose, 1.5 mL of a 24-hour-old bacterium, cultured on tryptone soya broth (TSB; HiMedia, India), was placed in a microtube and centrifuged at 12000 rpm for 2 minutes. After adding TE buffer and lysozyme, the samples were incubated at 37°C for 1 hour. Then, the lysis buffer and proteinase K (Sina gene Co., Iran) were added, and the samples were maintained at 50°C for 1.5 hours. Thereafter, DNA was extracted, using the common phenol-chloroform method (16). The primers used for the amplification of mecA and coa genes are listed in Table 1. PCR was performed with the following thermal setting: 5 minutes at 94°C for initial enzyme activation, followed by 30 cycles of amplification (ie, denaturation at 94°C over 15 seconds for mecA and 30 seconds for coa gene, annealing at 55°C for 15 seconds for mecA and 45 seconds for coa gene, and extension at 72°C for 20 seconds for mecA and 2 minutes for coa gene) and final extension at 72°C for 5 minutes (17, 18). 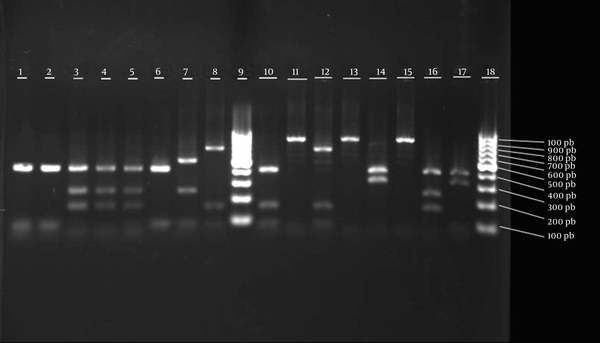 The PCR results were analysed using agarose gel 1.5% and visualized by ethidium bromide (Sina gene Co., Iran). Electrophoresis yielded bands of 310 bp for mecA gene and 650 - 1000 bp for coa gene (due to the diversity in 3’ terminal region). RFLP was performed by PCR amplification of coa gene and subsequent enzymatic digestion of the PCR product with AluI enzyme, as described in the literature (19). SCCmec and agr typing methods were performed as previously described (20, 21). The used primers are listed in Table 1. MLST was performed through PCR and sequencing of the internal fragment of arc, aro, glp, gmk, pta, tpi, and yqil genes of S. aureus, as previously described (22). The prevalence of genes among MRSA and MSSA isolates was determined and compared with clonal complexes via Fisher’s exact test. P value less than 0.05 was considered statistically significant. The results are displayed in Tables 2 and 3. MIC was determined for isolates found resistant on agar screening test. The results are listed in Table 2. Wound A4 ST1938 S I - ! Abbreviations: CSF, cerebrospinal fluid; UTI, urinary tract infection. Among 54 tested isolates, 11 were found to have mecA gene. Sccmec typing was performed for these strains; the results are displayed in Table 2. Typing of agr groups revealed that in 54 isolates, 90.8% (49 isolates) belonged to group I, 3.7% (2 isolates) belonged to group III, and 5.5% (3 isolates) were incapable of typing. None of the isolates belonged to group II or group IV (Tables 2 and 3). In this experiment, S. aureus isolates, containing mecA gene, were first subjected to PCR assay for coa gene. PCR yielded 650 - 1000 bp fragments (Figure 1). It was shown that AluI enzyme has specific restriction sites on coa gene (4). The fragments obtained by AluI restriction of coa gene are displayed in Figure 2. Enzymatic restriction of the majority of strains, containing mecA gene, showed similar patterns; the results are listed in Table 2. The fragment patterns obtained by AluI restriction of coa gene in MSSA strains are displayed in Table 3 and Figure 3. Lane 7, 50 bp molecular marker; lanes 1 to 6, coa gene PCR products of various isolates. 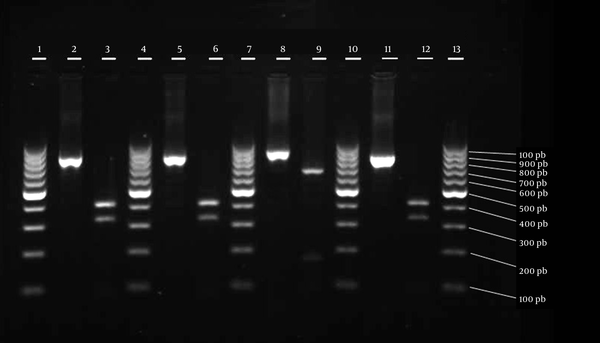 Lanes 1, 4, 7, 10, and 13, 100 bp molecular markers; lanes 2, 5, 8 and 11, undigested coa gene PCR product of various MRSA isolates; lanes 3, 6, 9 and 12, digested PCR products with AluI restriction enzyme. 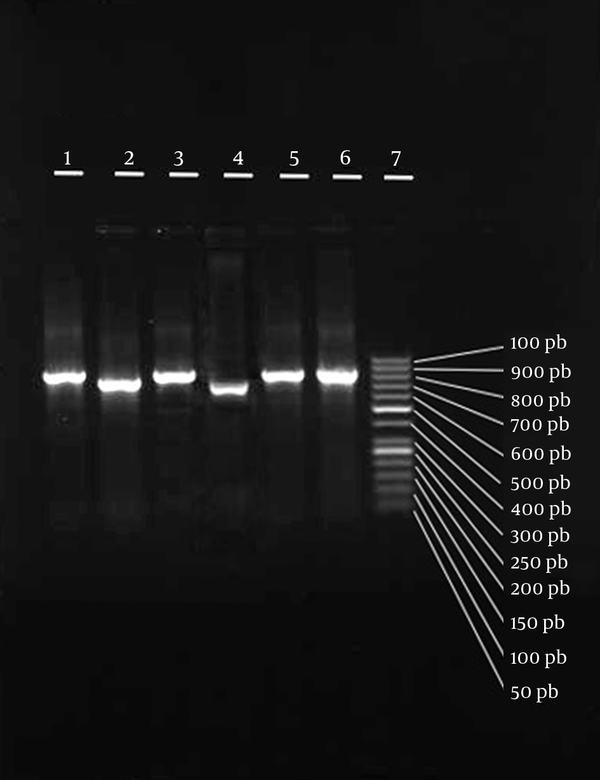 Lanes 9 and 18, 100 bp molecular marker; lanes 1 - 8 and 10 - 17, digested coa gene PCR products of various MSSA isolates with AluI restriction enzyme. As mentioned in our previous study, the majority of MRSA isolates belonged to ST239, whereas MSSA isolates belonged to various ST types. Novel STs were also found in this experiment, all belonging to MSSA strains (1). MLST results of MRSA and MSSA isolates are displayed in Tables 2 and 3. Previous studies in Iran have reported a high rate of MRSA infections (9, 23). The results of the current study showed an MRSA infection rate of 20.4% in the samples collected from different wards. In 2 studies performed in Tabriz (2013) and Kermanshah (2013), Iran, methicillin resistance rate was found to be 34.4% and 37.2%, respectively (24, 25). Also, in a study by Leandro et al. in 2008, S. aureus MIC was examined. MIC above 8 mg/mL was considered resistant, and MIC below 4 mg/mL indicated methicillin susceptibility (26). In the present study, the majority of mecA-positive strains belonged to type IV, followed by types III and I, respectively. In a study by Hallin et al. in Belgium in 2006, a total of 511 MRSA isolates were tested for Sccmec. The results revealed that most strains belonged to type IV, while a small number were of types II and I; also, Sccmec type III was not reported in any of the strains (27). In this regard, in a study by Soge et al., all MRSA isolates belonged to Sccmec type I, and mecA-positive, coa-negative S. aureus isolates belonged to a variety of groups (I, II, III, and IV) (28). Typing is of utmost importance for controlling resistant strains, understanding their epidemiology, and determining whether they proliferate from a single clone or multiple clones. In our previous study (1), all the strains (MRSA and MSSA) were subjected to MLST. Most MRSA isolates were epidemic MRSA and belonged to type ST239. It is noteworthy that 2 MRSA isolates indicated 2 novel STs, ie, ST1939 (isolated from sputum) and ST1942 (isolated from an abscess); these strains were of similar Sccmec types (group IV). It should be noted that STs were more diverse in MSSA strains. In addition, novel STs were found in the mentioned isolates, which are as follows: ST1938, ST1947, ST1939, ST1940, ST1937, ST1941, and ST1936. ST8 was the predominant ST in MSSA isolates, mainly collected from wound samples. Regarding the number of novel STs found in this study, it should be noted that no studies on MLST have been conducted in Iran, and it is possible to find more novel STs in extended geographical regions. In a study by Kim et al. in 2007, the prevalence of MRSA strains was reported to be 58.4%, of which 5.9% were community-acquired. On the other hand, the present results showed an MRSA rate of 20.4%; based on the findings, 5.9% of MRSA strains were community-acquired. In the present study, the prevalent ST was ST72, while other main STs, including ST239 and ST5, were the minority (29). In addition, MRSA isolates were community-acquired and epidemic. Community-acquired isolates are also prevalent in Korea, although the STs are not epidemic. In the mentioned study performed in Korea, community-acquired MRSA isolates were mainly from wound exudate, eye and ear secretions, and blood, whereas in the present study, community-acquired MRSA isolates, mainly belonging to ST239-Sccmec IV, were collected from wound, sputum, urine, abscess, peritonea, and blood samples. This is atypical of community-acquired MRSA isolates, since they are usually collected from more superficial infections (usually related to the skin). Therefore, these isolates are growing stronger to produce deeper and more severe infections; this in fact underlines the importance of public hygiene. It is well established that agr locus in S. aureus is a virulence regulatory system, with hypervariable regions making it a suitable target for typing. Similar to most previous studies, the present research found agr group I to be of the highest prevalence (90.8%), followed by group III (3.7%). It should be noted that groups II and IV were not found, and a number of isolates (5.5%) were nontypable. Basically, the prevalence of agr-specific groups in our isolates (type I being the most prevalent) was similar to the patterns found in other parts of the world, as well as the patterns previously reported in Iran (21). In addition to other typing methods, PCR-RFLP of coa gene was used in this study for typing MRSA and MSSA strains. The results indicated 1 sample collected from a person in a different hospital. Moreover, 15 MSSA isolates showed 8 RFLP patterns, which were different from the identified MRSA isolates. In the current study, MRSA isolates were not variable in terms of restriction patterns, whereas MSSA isolates had a variety of patterns (8 types). Himabinda et al. in 2009 reported that the majority of MRSA isolates belonged to the A10 pattern (30). In the present study, the majority of MRSA strains belonged to A2 pattern. Also, most of MSSA strains had A11, A7, and A10 patterns, which were more variable, compared to MRSA strains. In another study by Hata et al. in 2010 on S. aureus isolates, the differentiation power of various typing methods was analyzed. They reported MLST to have greater differentiation power, compared to RFLP for coa gene. The results showed high concordance between PCR-RFLP and MLST results (31). The present study indicated that the results of MLST and PCR-RFLP assay for coa gene were consistent. A total of 54 isolates were categorized into 13 STs and 12 groups by MLST and PCR-RFLP methods, respectively. No significant correlation was found between the source of bacterial collection, ST, and PCR-RFLP pattern. It can be concluded that there is striking similarity in the differentiation power of MLST and PCR-RFLP for coa gene in the samples tested in this study. We would like to thank all the members of microbiology department of school of medicine, Isfahan University of Medical Sciences, Isfahan, Iran. Authors’ Contribution: Study concept and design: Seyed Asghar Havaei, Sinisa Vidovic, Jo-Anne R. Dillon, and Amir Azimian; acquisition of data and sampling: Seyed Mehdi Havaei, Mohsen Karbalaei, and Fahimeh Ghanbari; analysis and interpretation of data: Amir Azimian and Amirmorteza Ebrahimzadeh Namvar; drafting of the manuscript: Bahram Nasr Esfahani and Mehrdad Halaji; critical revision of the manuscript for important intellectual content: Mehrdad Halaji and Amir Azimian; study supervision: Seyed Asghar Havaei and Amir Azimian. Funding/Support: Isfahan University of Medical Sciences funded this project. 14. CLSI (2015). . Performance standards for antimicrobial susceptibility testing; 25th informational supplement.